The #1 Micro Mesh Gutter Guard in the World! 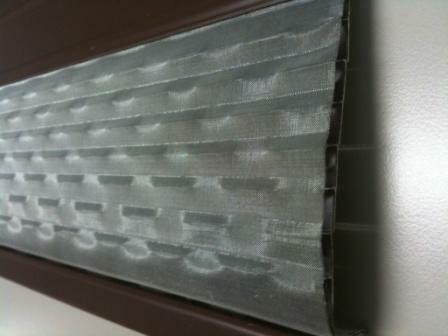 - "The Home Exterior Guru"
Screen-Mesh gutter guards are designed to eliminate gutter cleaning forever. Screen-Mesh is designed as a two piece aluminum body and a stainless steel micro mesh cover. The aluminum body is .019” thick and has concave half circle holes designed to pull water into your gutters. The stainless steel micro mesh cover is type 316ss and size 40×40 thread count and this makes the Screen-Mesh one of the most effective gutter guards in the world. This gutter cover is designed to eliminate all small particles such as pine needles, roof grit, pollen strands, and small leaves from entering the gutter system. We offer a 100% MONEY BACK GUARANTEE should your gutter system ever become clogged as a result of having Screen-Mesh gutter guards installed on your home. Screen-Mesh gutter protection fits on your existing gutters with no need to replace your gutters that are in good shape. Screen-Mesh slides under the first row of roofing shingles and is not attached to the roof like traditional reverse curve gutter guards. Screen-Mesh gutter guard is screwed down at the bottom lip with matching colored screws. The unique design of the Screen-Mesh gutter covers allows installation to be trouble free on any type of roof system including asphalt, cedar, and metal roofs. 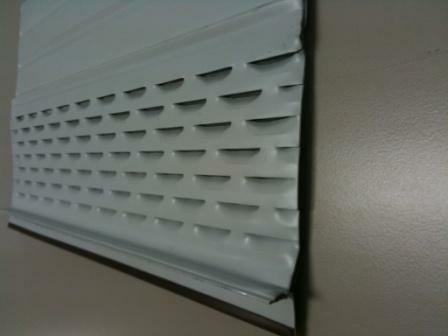 The Screen-Mesh gutter protection is available in white, brown, charcoal, bronze, and cooper. Because of the low visibility of Screen-Mesh gutter guards we can match them to any gutter system and they virtual disappear into your roof line leaving the beauty of your home in place. 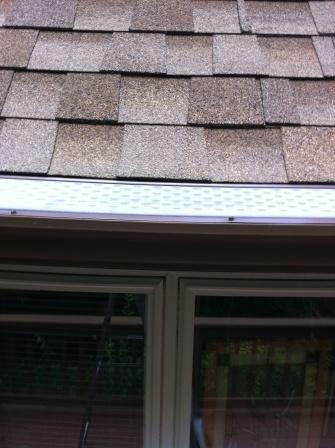 As you can also see the Screen-Mesh gutter cover is installed at the same pitch of your roof. 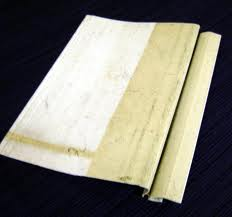 This allows debris to simply be blown off or washed off during a rain. 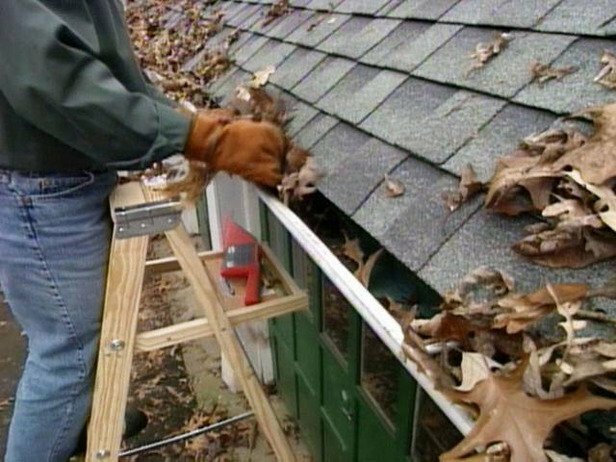 Cheaper, do-it-yourself type, of gutter guards catches and holds the debris. These types of gutter guards allow small debris to enter the gutters and the gutter covers collapse from the weight of debris building up on them. 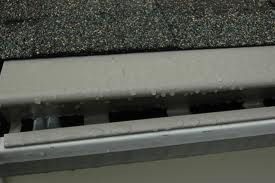 If you are not aware that the gutter guards are not working it will result in larger problems you have to deal with; such as water not flowing properly in your gutters causing the water to back up into your roof system and could damage your soffits and fascia boards on your home. 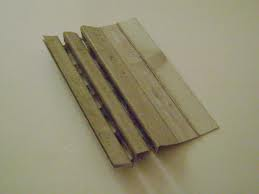 The most common and antiquated type of gutter protection is called the Reverse Curve gutter guard. Reverse curve gutter covers become a safe haven for bee’s nests, bird nests, and mosquitoes. 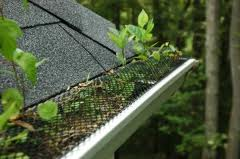 So if you like helping nature in this way we recommend this gutter guard. Functionally, Reverse curve gutter covers work on the principle of water surface tension. Water surface tension is the physical law of water adhering to a curve as it flows. This principle works fine under controlled environments. However, when you put this gutter cover to the test of real life it fails. Primary due to the surface tension being broken by dirt and debris that builds up on the nose of the gutter guard. 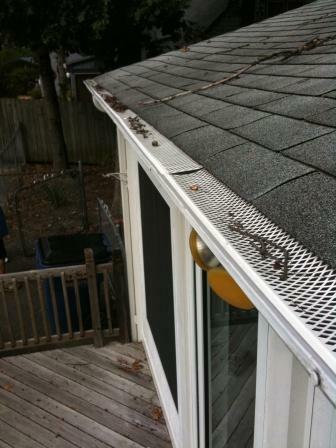 We also found that all gutter guards work when it is perfectly dry outside. The debris will simply blow off. In reality when it rains and you have debris sitting on your roof or the wet leaves and debris falls onto your roof and start to wash down towards the gutter protection; the debris becomes part of the liquid or water and washes right into your gutters with the water. Another common factor is the roof grit on your roof continuously sheds small particles of roof grit. This roof grid flows into the bottom of the gutters and creates a damming effect for water to properly flow out of the gutters and into the downspouts. The only true way to eliminate this is through “filtration”. That is what the Screen-Mesh gutter protection does to small debris is filters it from water leaving nothing but water flowing in your system. The best warranty a reverse curve gutter guard company can offer you is a “free gutter clean out” if your system gets clogged. 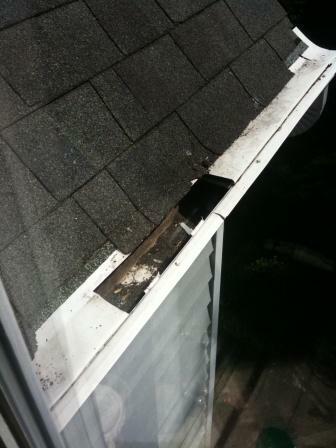 My question is do you want to hire a company to give you “gutter service” or true “gutter protection”.